The first 3D printer to reach Earth's orbit was launched this week aboard SpaceX's Dragon cargo ship. Destined for the International Space Station (ISS), the 3D printer (designed by 'Made in Space') will allow astronauts to experiment with fabrication in orbit. While the 3D printer will be limited in terms of materials and the size of the objects it can print, and with its prints of limited utility to astronauts, it is still a crucial first step on a road toward immense implications. Below are 3 of these implications. Until now, any object or tool required on space missions either had to be rigged from existing objects on hand or launched into orbit. Rigging objects is a solution of last resort, something that Apollo 13 astronauts were famously required to do in order to save their ill-fated mission to the moon. Launching objects into orbit is a costly and time-consuming proposition. But with a 3D printer, this is no longer a problem. As long as input material is on hand, any object astronauts are capable of designing or have on digital file, can be fabricated on demand, aboard the space station. Made in Space is currently working on a system that will recycle spent input material making it possible to print out and reprint designs perpetually. to simulate zero gravity in Earth's orbit. For carefully planned missions on the ISS and with regular resupply missions able to provide astronauts with everything they could possibly need, this is not so much an issue. However, on longer missions, to say the Moon or Mars where mission parameters may be unpredictable and resupply missions are out of the question, the ability to fabricate replacement parts, tools, and other objects can make all the difference. Because a 3D printer works by taking a digital file and converting it into layers of printed material, astronauts on space missions could use files from three possible sources. They could design the object themselves with 3D design software. They could pull it from a library of objects on their hard drive. Or third and more interestingly, they could have it sent to them from Earth where engineers could design, modify, and re-modify any idea they can imagine. Instead of sending a physical article to the astronauts which may not even be possible, they can instead send the digital file via communication signals at the speed of light. Once received, the 3D printer can begin printing, resulting in an object designed on Earth, fabricated and placed in the hands of astronauts hundreds of thousands of miles away. One of the biggest limitations on what we can build in space is the amount of material we can launch into orbit from which to build. What if instead, fabrication tools like 3D printers could be launched and with a limited amount of material, fabricate larger tools to begin heavy construction in orbit. Asteroids and other sources of material already beyond Earth's gravity could be utilized to construct everything from spacecraft to orbital colonies. Amid this process, smaller Earth-launched fabrication systems could scale themselves up in both numbers and size to meet any demand. The first two implications should be self-evident. We already have a 3D printer in orbit now that soon will be printing objects on demand. In addition to tests run by mission control and astronauts, design contests among students on Earth are ongoing and finalists will send their ideas via data-link to the ISS to be printed out aboard. In essence, students will "teleport" their designs to astronauts with the final product printed out in orbit and placed in the hands of the ISS' crew. 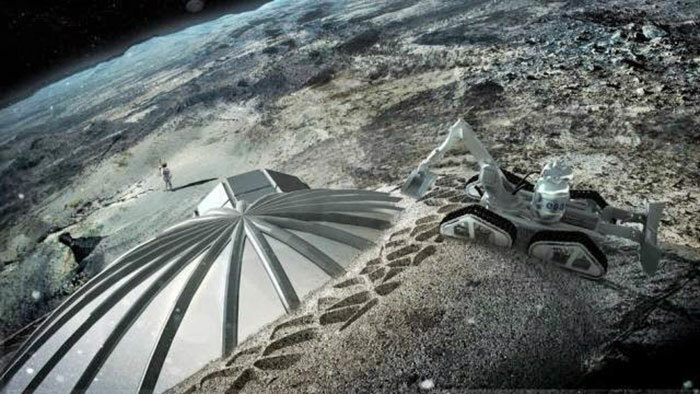 Renowned architectural firm Foster + Partners for example, has teamed up with the ESA to see how feasible 3D printing is with lunar soil. The concept they developed includes an inflatable bladder that forms a dome upon which 3D printed material is deposited before hardening and providing a protective covering for the structure. There are already large-scale architectural 3D printers on Earth and coupled with lessons learned from Made in Space's 3D printer now in orbit, devising ways of printing architecture beyond Earth's gravity is the next logical step. Deep Space Industries (DSI) is already developing a fleet of autonomous and remotely operated spacecraft to search out and explore asteroids for their potential mining and use as building materials. 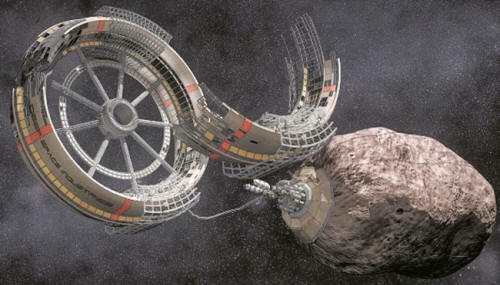 During DSI's initial public roll out, concept art depicted a torus-shaped space habitat (known as a Stanford torus) being "spun" out of an asteroid. 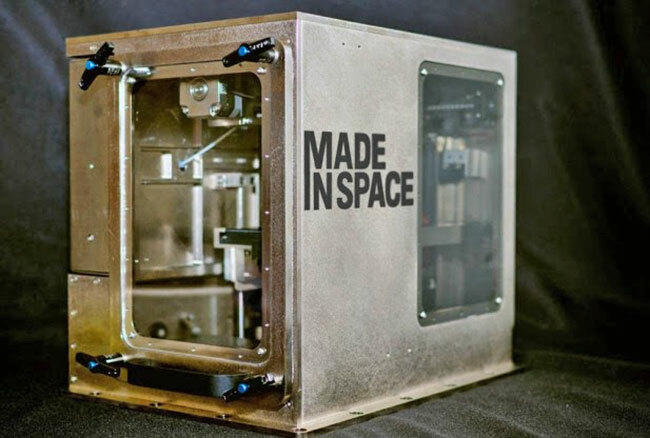 While the initial prints aboard the ISS may not be overly impressive, the launch of Made in Space's 3D printer into Earth's orbit and its use is a necessary first step on a much larger and awe inspiring journey. Just as the Wright Brothers' first flying machine was considered a novelty of little use, so too may the first 3D printer in space. But just like the Wright Brothers' first flying machine, the first 3D printer in space carries with it immense, potentially paradigm-shifting implications. The former ushered in the dawn of an age of human flight, the latter may usher in the permanent settlement of humanity amongst the stars.